Childcare Promotes Emotional Development In Young Children! Like physical and mental growth and development, emotional development is also vital in young children. Though your little ones might not be able to speak or tell you exactly how they feel about things, they will let you know through their actions if they are frustrated, happy or tired. Even at their young age, kids start to learn the skills they need to start building the foundation they need to understand feelings, their own and others’. How Toongabbie child care centre help boost emotional development in children? There are so many factors which can help improve your kid’s emotional development which includes being a part of the best child care centre. 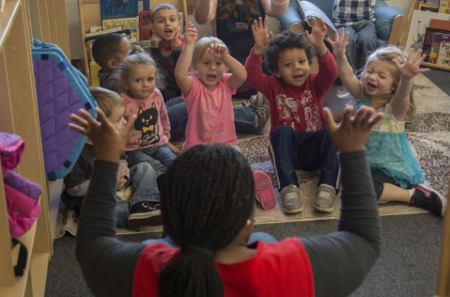 High-quality childcare offers programs to introduce language to help them convey their thoughts as early as six months old. This helps reduce frustration which children feel when they cannot express themselves by helping to communicate more effectively. Here are some ways how child care centres in Toongabbie improve your child's emotional development. You can teach your little one 123s and ABCs, but how will they grow emotionally and socially if they are not exposed to children of their age? In School, they will, of course, be able to interact and connect with other kids and adults. However, the school itself is largely a social one! If a child is not used to be around with other kids as they spend most of the time only with their parents, their participation in early learning programs is a perfect way to expose them to be with new people. Thus childcare will make going off to school much more relaxed. A place for them in society! Did you know, integrating your kid in Childcare will help them to discover their role in society? Yes, they understand their role at home, but how will they know what is expected of them outside of their family units? Attending child care will help them recognise that they are an integral part of the society outside their home. Connecting with other children is especially important if your child is a single child. Connecting is incredibly vital for emotional development in young children. Those who do not connect with other kids are prone to develop separation anxiety. By offering an opportunity for your child to participate in Toongabbie child care, you are providing them a way to connect with different people other than their family members at a young age. Doing this will make your kid’s transition to kindergarten a lot easier. There are so many reasons why you should enrol your kid in childcare centres Toongabbie where enhancing their emotional wellbeing is just one of them. Join up your child in the best childcare centres and give them a bright future. The author owns Toongabbie child care centre. Dedicated to giving children the brightest start, with a team of trained professionals and advanced teaching methods he offers the highest level of personal care and state of the art learning environments. Visit https://www.toongabbiechildcare.com.au/ for details.